Sabbir Khan’s third film could have been easily called the Tiger Shroff showreel. 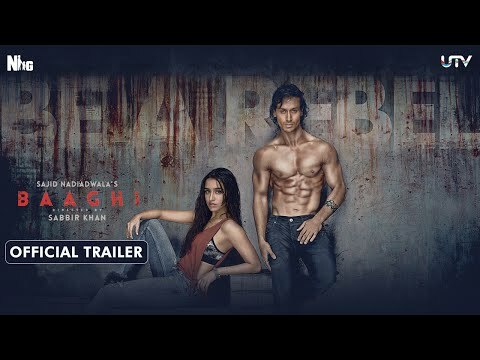 Every second scene of “Baaghi” is a chance for Shroff to show off his rippling muscles and an incredibly flexible body that he manages to contort into all sorts of positions while fighting the bad guys. Everyone else in this two-and-a-half-hour film is incidental, as is any semblance of a story or plot. Shroff plays Ronnie, an orphan who lands up at a kalaripayattu school to learn the ancient martial art in the southern state of Kerala. The tutor (played by real-life martial art expert and the film’s action director Shifuji Shaurya Bhardwaj) takes him under his wing and trains him in the art of breaking a man’s bones with the mere flick of a finger. Ronnie also meets Sia (Shraddha Kapoor), a giggly, air-headed girl who falls for him because it rains every time they meet and she is convinced it is a karmic sign of some sort. Sia’s shrill manner and her perpetually wide-eyed demeanour make you wonder why Ronnie is so smitten. But the romance is handled so fleetingly by the director that it becomes just a vehicle to get to a point where Shroff is required to unleash his action moves. The villain is a menacing looking Raghav (Sudheer Babu), who is the son of Ronnie’s mentor and runs an illegal fight club in Bangkok. Raghav is equally smitten by Sia (another of this film’s mysteries) and kidnaps her, imprisoning her at his headquarters. This sets the stage for even more conflict, plenty of broken bones and some well-executed scenes in which Shroff proves he is an action hero in the making. Borrowing heavily from films such as “The Raid-Redemption” and “Fight Club”, Sabbir Khan puts in enough exciting action in the 139-minute film for lovers of this genre to be satisfied. The film is tailor-made for Shroff and he doesn’t disappoint – he executes a kick with the same fluidity and grace as a dancer and makes the toughest of sequences looks scarily easy. The easiest of romantic scenes requiring a bit of emoting – that is a whole other story. But if you can forgive the lack of logic and acting chops, then “The Tiger Shroff Showreel” might be worth your time.